Suport public transporation in Cincinnati. 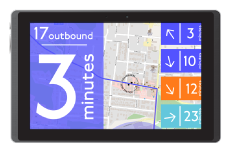 Display real-time bus arrival data for Cincinnati Metro in your bar, restaurant or retail store. Bus Detective displays start conversations and draw people into your business. People stay longer—and buy more—if they know exactly when the bus is coming. Encouraging bus ridership creates more foot traffic for your business. Become a Founding Partner with Bus Detective. The first 10 Founding Partner businesses will receive a tablet for $20. We'll install it at your business with the app up and running. It will display routes and arrival times for the nearest bus stops. As a partner, you're responsible for providing WiFi and display space. Bus Detective Public Displays are a People’s Liberty Project Grantee. The team behind the displays includes Daniel Schleith and Nate Wessel, graduate students and public transportation researchers, and Brad Thomas, a SORTA board member.